On the Corner of Hollywood and Vine. 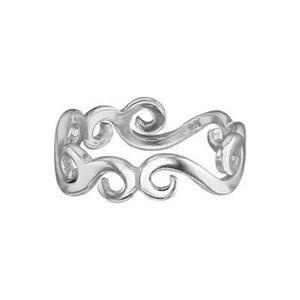 A perfect description for our SR387 – Bright Sterling Silver 5.2mm Vine Ring Band. Size 7. Whether you see Vines or Waves – it’s a lovely ring packed with Star-Studded possibilities! Need it to be larger? Our President, Hilary Halstead Scott, suggests that you saw out a segment to create a unique shank. Or you can solder a Tube Bezel into the curve of a curling tendril to add some Gemstone Sparkle. Notes: Brite finish. Widths will vary +/- .3 mm. Thickness will also vary slightly. I love it! The only thing that would make it better is if it came in different sizes. This is a nice ring, but can't sell many because it only comes in 1 size. Please get more sizes.